Subject: Antique print, untitled. 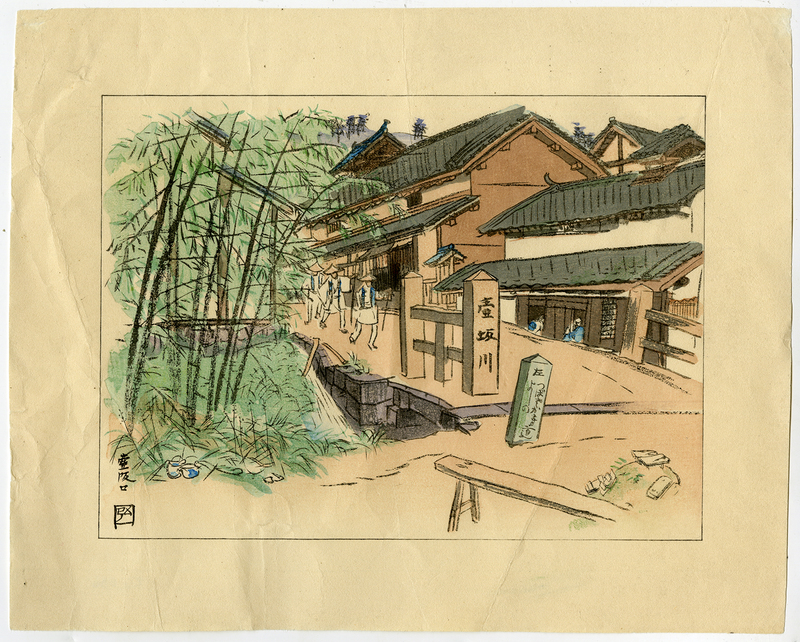 This Japanese woodblock print depicts a street scene with a bamboo forest at left. Condition: Fair, given age. Paper with several creases and wrinkling. Some remains of tape on rear from previous attachment. Top corners thin. General age-related toning and/or occasional minor defects from handling. Please study scan carefully. Medium: woodblock print with original hand colouring on modern Japanese paper paper. Size (in cm): The overall size is ca. 29.5 x 23.5 cm. The image size is ca. 23 x 17 cm. Size (in inch): The overall size is ca. 11.6 x 9.3 inch. The image size is ca. 9.1 x 6.7 inch.